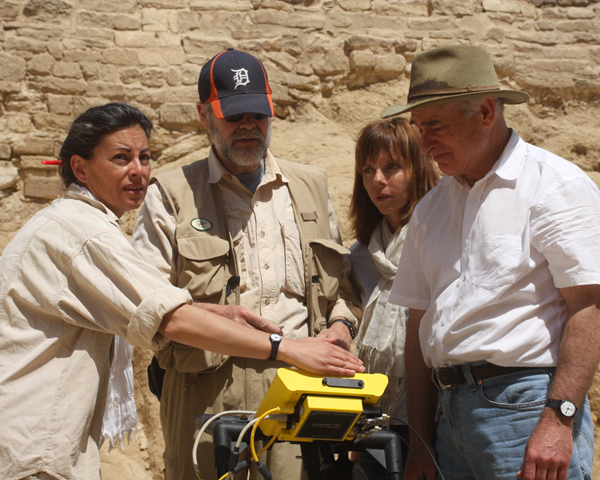 Ana Tavares, Mark Lehner, Joan Dash and Glen Dash confer during the Dash Foundation’s ground penetrating radar survey of the Sphinx. Immediately after the data was taken, the results of the ground penetrating radar scan were displayed on the screen. The results were used to identify where and how additional tests would be performed. Ana Tavares is the co-field director of Ancient Egypt Research Associates (AERA). Mark Lehner is AERA's President and a leading authority on the Sphinx. The project was undertaken under the auspices of the Supreme Council of Antiquities, Dr. Z. Hawass, Secretary General.